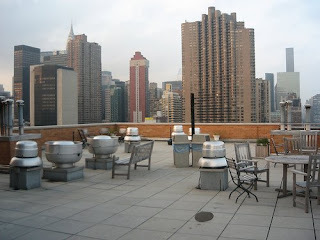 Today I presented to some advocates about the program that I work for, outside on a roof/lounge area. It was crazy. Normally, we sit in a conference room with a powerpoint and go through our amazing presentationn (yes I said amazing). Instead today people were sitting in deck chairs and benches, half in the sun and half in the shade. I had to take my shoes off and walk barefoot because the rubber roofish material was gonna make me fall. Side note, thank goodness I got that pedicure over the weekend because I would not have been able to my show my feet before. So here E and I are presenting and we have to yell so people hear us and then our voices echo around the open building. It was the strangest place I have ever done a presentation in. If you ever have presented you understand what I am talking about. Come on, how can you concentrate in an environment like this?